1. Pour in 2L of boiling water into a bowl. 2. 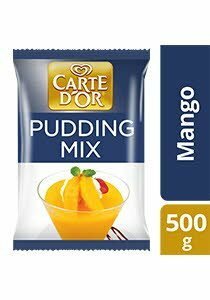 Stir in 1 pouch (500g) of CARTE D'OR Pudding Mix slowly until dissolved. 3. Pour into moulds, cool and refrigerate.